Department of Environment and Natural Resources Sec. Roy Cimatu ordered some resort owners along the Alona Beach in Panglao to demolish structures built along the 20-meter easement zone after he inspected the almost kilometer-long shoreline in March. An order of demolition targeting alleged easement violators along the seashores in Panglao has gained strong opposition from resort operators following notices of violation issued by the Department of Environment and Natural Resources (DENR). Article 51 of the Water Code of the Philippines prohibits the building of structures of any kind along the shores of the seas and lakes, banks of rivers and streams within the zone of three meters in urban areas, twenty meters in agricultural areas and forty meters in forest areas. Earlier, DENR Secretary Roy Cimatu gave establishments in the Alona Beach area three months to voluntarily demolish structures built within the 30-meter salvage zone with the immediate destruction of concrete barriers erected ostensibly to minimize sand erosion as the top priority. Quiwag, in a meeting with the Local Government Unit (LGU) of Panglao on May 4, 2018, revealed that several owners willingly remove the structures they believed breached the easement zone even as the eight resort owners expressed “great shock and surprise” upon receipt of the PENRO notice of violation. 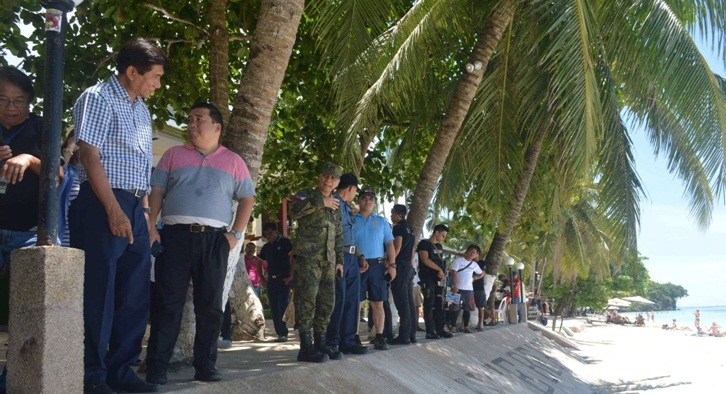 Five resorts found by PENRO breaking into the easement zone claimed that in 2008, a survey on the 20-meter salvage zone along Alona Beach in Barangay Tawala was conducted by the DENR under the supervision of then PENRO Head Nestor Canda. At that time, markers were laid by the DENR along the beach clearly indicating the boundaries of the 20-meter salvage zone that served as their point of reference in the construction of their respective buildings, according to the resort owners. The MR’s filed by affected resort owners sought the revocation of the notice of violation issued by the PENRO “as this is a grave constitutional violation”. The 10-day demolition ultimatum, according to the resort owners was “vague, without due process, no details of the alleged exact violation and “was too short a notice”. The Chronicle also learned that several members of the Panglao Island Chamber of Commerce will seek the assistance of marine biologists and members of scientific groups involved in environmental conservation that will compose their own technical working group. The PENRO is scheduled to call a special meeting with the Alona group of resort owners to thresh out unresolved issues and concerns arising from the imminent demolition of structures deemed violating the easement law. The eight resorts who filed their MR’s on the notice of violation issued by the PENRO were Pyramid Beach Resort, Hayahay Resort, Genesis Dives, Alona Vida Beach Resort, Greek Taverna, Cliffside Resort, all located in Tawala, Panglao.